What fires can you have? Find that information here. This recall involves two models (PI2010CA and PI9010CA) of Kidde dual-sensor (photoelectric and ionization) smoke alarms manufactured between September 10, 2016 and October 13, 2017. The model number and date code are located on the back of the unit. The affected smoke alarms have a pill shaped design on the front of the unit. The affected models have a yellow cap visible through the opening on the side of the alarm. This recall DOES NOT involve the smoke alarms installed through the S.A.F.E. Family Program (Smoke Alarms for Every Family) throughout the province. The smoke alarms installed through the S.A.F.E. program are Kidde Model I9010CA ionization type smoke alarms. On Wednesday October 25th, 2017 the Mayor for the R.M. of Taché took time out of his busy schedule to recognize the contribution of a member of the Taché Fire Department. Joey Plett dedicated 8 years to the department and retired as the Assistant District Chief for Landmark. Landmark Fire Hall also presented Joey with a departing gift. Although a number of Municipalities around the R.M. of Taché have implemented a Burn Ban, the long range Fire Danger outlook indicates that conditions will be improving over the next few days; therefore, the R.M. of Taché Fire Restriction will remain at Level I. Residents are urged to be vigilant when burning leaves and brush and that the Fire Department should be notified of your intent. A review of the Fire Restriction Levels, Open Air Fire regulations and what is an approved fire receptacles can be found here. How to make a home fire escape plan. PDF found here. 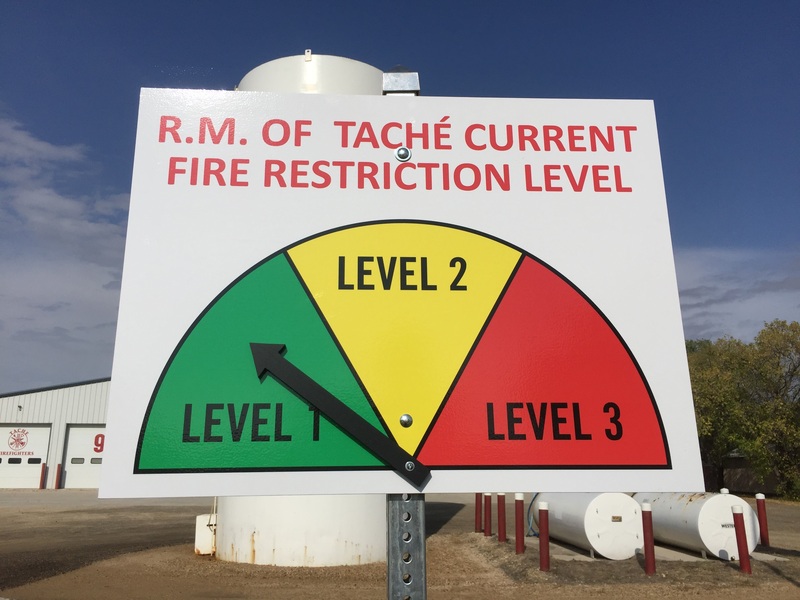 New Fire Restriction Level signs now located at each Fire Hall. Reminder that for the R.M. of Taché, a crop residue burning permit is required from August 1 to November 15. Manitoba Crop Residue Burning Program Website is here. Council Members took the opportunity to train with the Fire Department on June 18th. The Fire Department is looking for recruits. A firefighter recruitment package can be found here. Further information about the fire department can be found here here. The Rural Municipality of Taché in conjunction with the Fire Department has adopted a 3 tiered format whereby present conditions will determine the level to which a burn ban will be implemented. To view the process go here. For information please contact the Municipal Fire Chief 204.509.3549 or email.